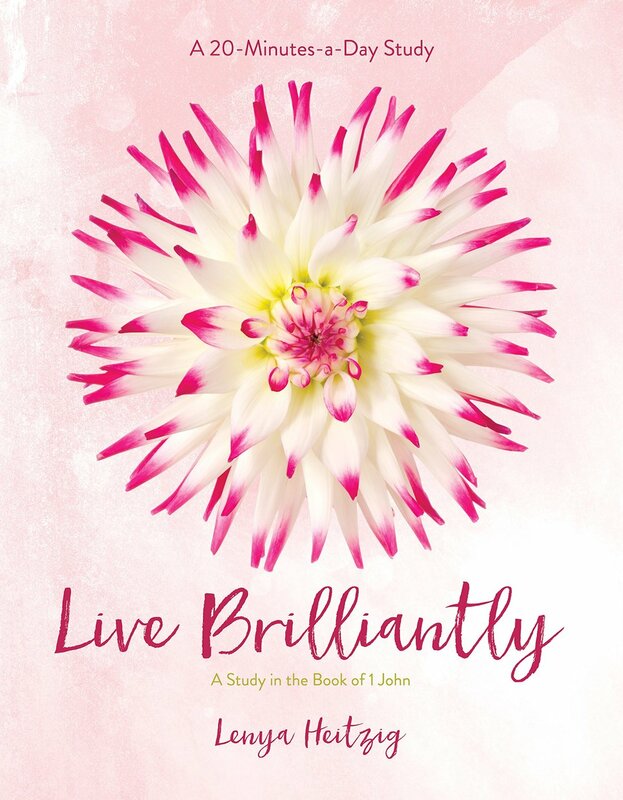 Live Brilliantly: A study in the book of 1 John by Lenya Heitzig released at just the right time. A Bible study designed to be completed in just 20 minutes a day, Lenya takes 12 weeks to guide us deep into the short and powerful book of 1 John. With an emphasis on the love of God toward us and our love toward one another, we learn how to live in the brilliant light of Christ and manifest it toward others. Lift Up-starting the session with prayer. Look At- approaching the text with inductive questions, the who-what-when-where-how aspects of the text. Learn About- I love this, each page has sidebar notes that give insight into key questions in the study. These include cultural context, some commentary and my favorite, word definitions. Live Out- These are the application questions. Listen To- Quotes from a variety of authors, teachers and speakers that impart wisdom we can apply to our own lives. The introduction section gives an important overview of the book of 1 John, and the section on “How to get the most out of this study” is a helpful preparation before you get started. I love that the Bible text of that day’s lesson is in the book, so your highlights and notes remain with your study questions. There are illustrations and explanations throughout each lesson that help you connect the text to the questions, bringing clarity and insight to the application of God’s truth in your own life. One downside for me, and probably only me, is that the layout of the book doesn’t always make it easy to answer the questions right in the book. Again, a personal thing for me but I like to keep my notes and answers all in one place when I do a study. Some of the questions have ample room to answer, some hardly any. You are encouraged to journal along while completing the study, so a separate journal for just Live Brilliantly might work best for you. I also did this in significantly less time than 12 weeks, and didn’t feel rushed or as though I hadn’t absorbed the lessons. I mention this because like I did, you may have a time constraint and I don’t want you to dismiss this great resource because you think you don’t have 12 weeks to devote to it. While I did this study on my own, it is a great format for a small group study. Either way, there is lots of learning available to us here, and I encourage you to grab a copy so you can begin to Live Brilliantly. Read (and study) well, friends!